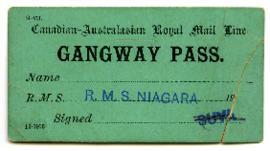 Gangway Pass on the R.M.S. Niagara ship. Bill for grocery items from The W.H. 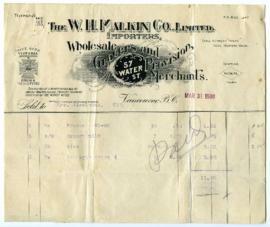 Malkin Co., Limited, importers, wholesale grocers and provision merchants, for [Mrs. Siedleman]. Bill is issued on March 31, 1908. Invitation to the wedding of Jeanne Tardiff and John Vallie in Vancouver for September 11, 1929. Undated card sent to Harry Seidelman from a relative in Seattle. Card is in response to a letter from Harry inquiring about his family history.